Playing online poker can be a lot harder than playing live poker. There are many reasons for this. I will explain why playing poker online can be harder, and will try to help you get better in the process! One key mistake many players who begin to play poker games online make concerns the stakes of games. 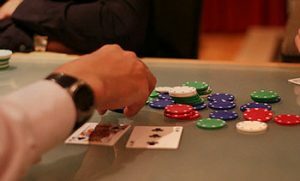 Online cash games go faster, so what live games consider small stakes end up being more costly. Stakes of one or two dollars can be disastrous for players who do not have a good grasp of poker strategy. Your bankroll will quickly run dry if you only have a little understanding of the basics of poker. Many players who play at these stakes have a deep understanding of the game and use tracking software to increase their knowledge. It is better to play at micro stakes in order to ensure you can play longer. This also helps you get used to playing online. 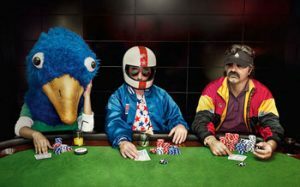 When you start playing, begin at the lowest possible stakes until you have a firm grasp on how fast online poker plays. Also, be sure you have a solid understanding of the ins and outs of the online poker world! A poker HUD is a tracking software that collects data based on hands dealt. Not all sites allow it, but many do. It can provide a distinct edge that many winning players will take advantage of. For example, it can tell you how often another player folds or raises or how likely players are to respond to certain situations. Using a HUD is not against most sites’ rules. However, it is best to use it if you feel you need some insight into other players’ actions. This tracking software can greatly improve your odds if you use it. But it still requires you to have a deep understanding of poker strategy. It is best not to rely too much on the stats it provides, but HUDs can absolutely help if you use them correctly! Another main difference between online and live poker is the player base. Many online poker rooms are filled with younger people than you would find in casinos. These players are more tech-savvy and make use of many resources online that live players would not. Poker HUDs are one example, but there are others too. For example, online poker players are more likely to know deep poker strategy. They are very knowledgeable about it, as the internet offers a vast resource of poker information. There are also training sites available, so they can practice without worrying about spending real money. 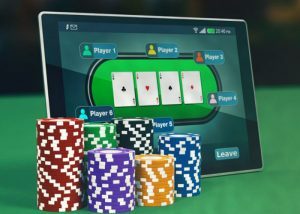 Online players are also likely to have played more hands due to the speed of playing online, and they do not look at the short-term results. Conversely, they tend to look at the statistics over a large number of hands. They also do not get discouraged after a few unlucky losses but keep pushing on instead. Moreover, another difference between live and online players is that the former are more reluctant to play against the opponents they’ve previously lost against. However, that is not the case with online players — they do not shy away from conflict! Online poker games are a lot faster than live poker ones. Live poker tournaments are slow. The players take their time and size one another up because they are able to look at each other and judge each other’s mannerisms. On the other hand, online players can only see the cards, and as a result, games move a lot faster. It is harder to play at a faster pace and win consistently if you are not very good. In addition, if you are multi-tabling, you have even more to keep track of. That can impede your ability to play well consistently. Also, winning poker players respond to bad beats differently. The variance online is wilder, and you will see your bankroll increase and decrease rapidly. Since this is common, you must look at your overall progress rather than individual hands or games. When games go as fast as they do online, this is to be expected, so do not be discouraged! These are the differences between live and online poker. Online poker is harder mainly because the games go much faster and because players tend to be more knowledgeable about poker strategy. Improving your poker game by using training sites, a HUD, or just reading about strategy will help greatly. Also, be sure to begin at the lowest stakes possible until you get a grip on how different online poker is from live one!